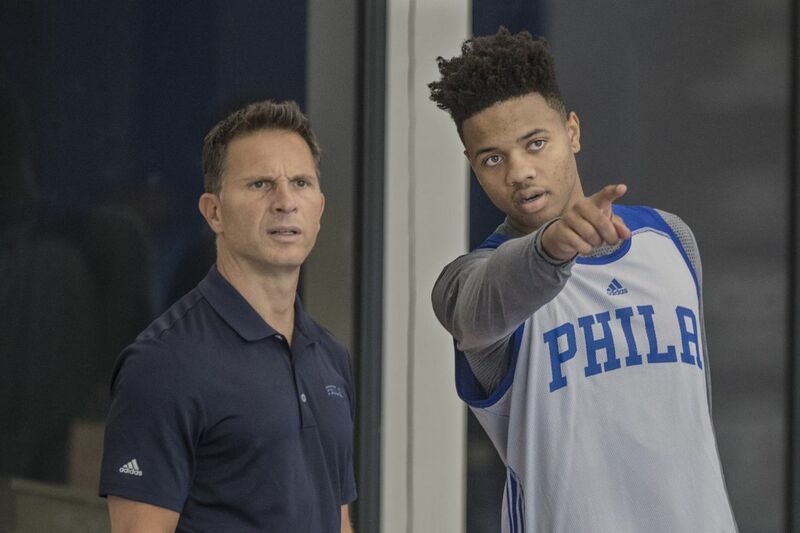 Sixers’ assistant coach Billy Lange with Markelle Fultz during training camp. Billy Lange is the Sixers assistant coach in charge of developing Ben Simmons and Markelle Fultz, the last two No. 1 overall picks in the NBA draft, which makes him a unique commodity. Lange, 46, belongs to another unusual demographic, too. He's a Philadelphian who believes his town is a city of winners. Lange sees the Eagles' win in Super Bowl LII as part of a continuum, not an anomaly. Unlike a Philly native who is, say, 65 or older, he didn't live through the Phillies' collapse in 1964, which, for most sports fans in the region, amplifies the assorted agonies that have followed. Unlike a Philadelphian who is, say, between 30 and 40, Lange didn't spend his childhood and adolescence stranded in a desert of sports irrelevance. Lange saw the Eagles play their first Super Bowl on Jan. 25, 1981, about 2 1/2 weeks before his ninth birthday. The previous May, he'd seen the 76ers make it to the NBA Finals, the Sixers' first of three Finals in four years. The Phillies won their first World Series in October of 1980. They returned in 1983, five months after the Sixers won the NBA title. Two years later, Villanova won the NCAA championship. The Flyers have won two Stanley Cups and played in six other Cup finals since he was born. "I just figured it would always be that way," Lange said. It wasn't, of course. No Philly team won a championship from the Sixers in 1983 to the Phillies in 2008, but the impression had been made on Lange. Now, with Villanova's NCAA title in 2016 and with the Eagles' Super Bowl win last month, Lange's impression is reinforced: This is a city of winners. He can't wait to be next. Like the rest of the Sixers franchise, the Eagles' underdog charge to the top of the NFL left him energized. Going into Sunday night's game at Milwaukee, the Sixers were 9-2 since Nick Foles ran the Philly Special and caught a touchdown pass. "Absolutely!" Lange said last week. "Just the energy we've had for the next games. We would be ignorant to dismiss this streak. There's definitely an energy. It inspires hope." "You can forget that winning a title is a possibility." It's easy to forget that when you're an original part of The Process. Lange joined the Sixers in 2013, the first year of a complete tear-down that resulted in 47 wins in the first three seasons. They have a good chance to win 47 games this season alone. They were 34-27 entering Sunday's game, a 45-win pace. And they're hot. So are the Flyers, who are 10-2-2 since LII. Even the Phillies, with innovative new manager Gabe Kapler in charge of a roster full of exciting young players, have more juice than they've had in years. The Sixers coaching staff, including Billy Lange, left. Lange knows Philly wasn't exactly Titletown USA for most of his life, but Lange never considered the landscape to be as bleak as most. "I mean, I loved that Phillies team in '93, with Darren Daulton and Lenny Dykstra," Lange said. "Everybody did, right?" By then, Lange was playing collegiately for Rowan. He started with his dad, Bill Sr., the coach of Bishop Eustace, and made stops as an assistant at Philadelphia Textile and La Salle; became head coach at the U.S. Merchant Marine Academy; went to Villanova to work for Jay Wright; became head coach at Navy; went back to 'Nova to be Wright's associate head coach; then, in 2013, landed with Brett Brown and the Sixers. That whirlwind of movement might have disconnected Lange a bit from the Philly sports scene. Lange checked in when the local teams got to be good. That has been startlingly rare. The Phillies were under .500 for 14 of 16 seasons from 1987 to 2002. The Eagles won just two playoff games from 1981 to 2000. The Sixers have made it to the Eastern Conference Finals just twice since 1983. He's felt some of the pain, but it always was softened by the joys. He remembers the failed promise of the Buddy Ryan Eagles, but also watching Randall Cunningham thrill him at Veterans Stadium on hot September afternoons. He remembers his grandfather, Harry Schaefer, taking him to West Chester University to watch the Eagles at training camp in the 1980s. "I still remember losing to Jim Plunkett and the Oakland Raiders," he said, referring to the team that beat the Eagles in their first Super Bowl appearance. "It left a sour taste in my mouth." That taste faded as the years passed, and as subsequent Eagles teams showed promise. Andy Reid and Donovan McNabb took the Birds back to the Super Bowl after the 2004 season, Lange had just started rebuilding as Navy's head coach. On the Sunday afternoon before the Birds faced the Patriots in Jacksonville, Fla., Navy won its third of four games, its best stretch of a bad season, and had beaten Army, to boot. Lange was flying high. "I ran home and got settled in," Lange recalled, "but, you know, they lost. I just thought they'd be back." They never made it back under Reid. When Doug Pederson finally won it all, Lange wasn't flying high. The Sixers lost at Indiana on Saturday, Feb. 3, their fourth loss in five games. They got Super Bowl Sunday off. Lange shared the moment with his family: wife Alicia and sons Will, 14; Matt, 12; and 10-year-old twins Marc and Jake. "We were invited to some parties," Lange said, "but when you're a true fan, you want to hang on every play." He hung on Alshon Jeffery's diving, 34-yard TD catch to take the lead; Foles' trick-play catch on fourth down; Zach Ertz's go-ahead TD catch; Brandon Graham's game-sealing strip-sack of Tom Brady. As Lange told that story, he realized something. One of the earliest memories for Will and Matt is the Phillies' 2008 Series win. They can recall the Flyers' run to the Stanley Cup Finals in 2010. All four boys have a connection to the latest Villanova basketball title team. And, now, they've seen the Eagles finally win a Super Bowl. "I tell them all the time," Lange said, "they have no idea how spoiled they are."